The horses on this sterling silver buckle were inspired by a frieze of horse heads at a 5th/4th century B.C. Celtic site at Roquepertuse in France. They are rendered in bold relief on a blackened background. 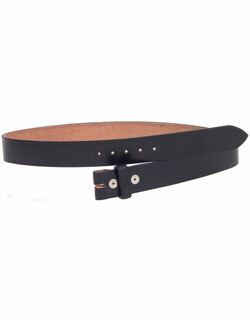 The buckle fits 1½ inch belts, such as our 1½ inch Bridle Leather Belt. The buckle size is 3 x 1-15/16 inches. Made in USA. These belt buckles are cast in solid sterling silver using the "lost wax" investment casting method. Each buckle made in this age-old jewelers technique must first be made in wax. The wax buckle is then "invested" or covered with a plaster of paris slurry and allowed to dry. It is then placed in a gas fired kiln and baked at 1500 degrees Fahrenheit for 12 hours, during which time all the wax in the plaster mold is burned out or "lost". The result is a cavity into which the molten sterling silver is poured. After cooling, the buckle casting is broken from the mold. At this point, the casting is black from the oxidation of the molten sterling silver and must be carefully ground, tooled and polished to achieve the final gleaming finish. The final finishing and tooling marks reflect the individuality of each buckle and attest to the craftsmanship involved in its unique creation. These solid sterling silver cast belt buckles, manufactured for us by Anacortes Brass Works, Ltd., meet the highest standards of craftsmanship possible in a cast sterling silver medium. Tarnishing is a natural occurrence with sterling silver and should be expected. To clean, polish with any silver polish and a soft cloth. When cleaning the Celtic Horse Buckle, take care not to polish the black background, which has been left with a dark oxidized background to show the horses in bold relief.